Almost every High School child knows that the Sun is 93 million miles (or 150 million Kilometres) away from the Earth. Despite the incredible immensity of this figure in comparison with everyday scales - or perhaps even because it is so hard to grasp - astronomical data of this kind is accepted on trust by most educated people. Very few pause to consider how it could be possible to measure such a distance - the 'Astronomical Unit' - and few are aware of the heroic efforts which attended early attempts at measuring it. Unfortunately, even most popular astronomy text books give insufficient information to allow one to see precisely how the task was accomplished. In the history of astronomy, the quest for the Astronomical Unit (AU) has normally been regarded as the quest for a more fundamental quantity: namely, the 'Solar Parallax'. The solar parallax is not a distance at all. 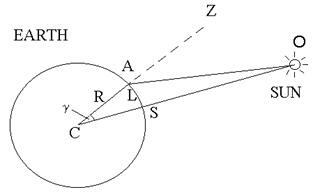 It is an angle: the angle subtended at the centre of the Sun by the Earth's radius (see Figure 1). If this angle is known and the radius of the Earth can be measured, then the distance to the Sun can be deduced by simple calculation. Clearly, the first piece of information which was needed in order to size the AU was the radius of the Earth.